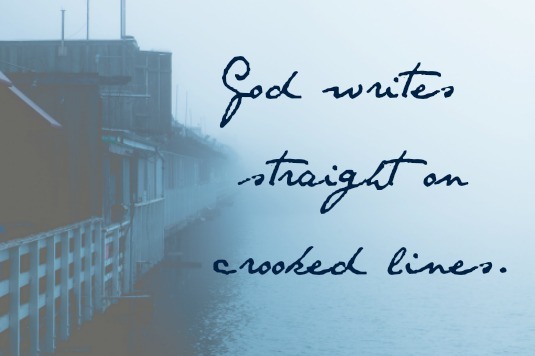 God writes straight on the crooked lines of our lives, whether those lines are crooked because of our own failures, or because He designed them that way. I always think of the biblical story of Joseph, whose life was so full of devastating twists and turns. Need a refresher on the life story of this inspiring Biblical hero? As a young man he was thrown into a pit and then sold as a slave by his own brothers, later falsely accused of impropriety by his master’s wife and thrown into jail, then forgotten by the freed fellow prisoner whose life he saved, then—miraculously—raised up by Pharoah himself to be a governor of Egypt. As governor, Joseph ended up saving thousands of lives from a severe drought–including the lives of the same brothers who sinned against him years before. Joseph was able to reunite with his father and repentant brothers, and they all grew old together in peace. How many of us give up on God at the first pit we fall into? How many of us give up on God when we feel the sting of betrayal, the loneliness of being forgotten by others, or the temptation to disenchantment from years of waiting? We must remember that God is a Master Weaver, and that His ways are far above our ways. He is worthy of our trust. When I graduated from high school, I spent some time modeling in Manhattan in hopes of making extra money to pay for college. My deeply felt experiences as a model were a major impetus in my re-conversion back to the treasure of my Catholic Christian faith. The seeds that eventually became a passion for sharing my faith with others were sown during that time. Since then, I have given many talks on dating, sexuality, body image, and faith. I started a women’s faith sharing group at our Catholic student center in college–a group that still meets today, a generation of college women later. And over the past six years, I have developed a ministry of faith through blogging, radio and podcasting. After Hurricane Katrina devastated my husband Michael’s hometown of New Orleans, he and his younger brother, Chris, decided to escape Louisiana the next summer to work as camp counselors in North Carolina. Michael met me that summer at camp, and Chris met my sweet now-sister-in-law, Jenay. After Michael and I got married, we moved to Houston for him to work at a job that ended up being a poor fit for him. While we lived in Houston, though, we helped found a community of young Christian families that is still alive and well today, even years after we moved away. The relationships we formed in Houston as a young married couple deeply shaped our marriage and parenting. While we lived in Houston, we risked everything to start our own business. After a serious accident that happened a year into running the business full time, we decided to sell the business and find another job for Michael. We moved back home to Louisiana and moved in with my parents indefinitely so that we could pay down debt. While our relationship with my parents actually grew wonderfully in depth and trust (a great and unexpected blessing! ), our marriage suffered terribly for a while. It was only then—in our lowest, darkest place–that our hearts were softened toward a gift God wanted to give us: the Domestic Church. There are so many ways that I see God weaving together the broken or frayed pieces of my life into something beautiful and good for me. God can weave together the joys, sorrows, failures, dead ends and false starts of our lives into a more beautiful tapestry than we can imagine. To cooperate with His work in our life, we only need to give Him the one thing that is truly ours to give: our will to trust. The post I’ve been waiting to write for two years.